Author: Stephen Leeb, Ph. 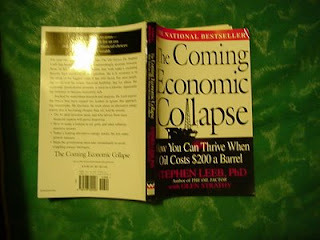 D.
Title and Subtitle: The Coming Economic Collapse: How You Can Thrive When Oil Costs $200 a Barrel. First, the author believes that our energy crisis is more urgent than climate change or global warming. He points out that the two major oil shocks of the 1970s were politically motivated (and he recalls the even-odd gasoline rationing after the shocks), but this time, he says, it really is related to “peak oil” and to not being able to find much more at reasonable prices. There are several possible outcomes. One is essentially a collapse of civilization, in what Leeb calls a loss of “complexity.” Something like this has happened repeatedly with large empires (the Romans) and small localized communities (as on Easter Island) and probably, in stages, to the Maya city-states. Generally they have happened because their collective “lifestyles” were not sustainable, and they depleted resources in some way (with the Romans it had a lot to do with overextension). He talks about the writings of James Kunstler, already presented in the “End of Suburbia” movies (review link) where society becomes decentralized and simplified, less globalized, and life becomes familial and adaptive. Possibly there could be extreme hardship for many communities or for more techno-dependent kinds of people (like me). That’s a worst case. But, with thoughtful political leadership, he believes that we can shift over to renewable energy and maintain our civilization. It is likely that he would agree with T. Boone Pickens that there could be intermediate stages moving from oil to coal or natural gas. But some of our problems really are psycho-political. There is a tendency for most people to follow “herd mentalities” He describes the experiments of Solomon Asch and Stanley Milgram in “groupthink.” Authoritarian or conventional people are more prone to this than “creative” or “open thinkers”; on the other hand, “creative” people may lack the social and adaptive connectivity to be believed. Leeb seems perhaps a bit self-contradictory in the level of confidence we should have in technology. The dot-com bubble was based on a herd-mentality belief that globalization and broadband would lead to endless profits. The clean energy boom (which Thomas Friedman predicts also, in another new book that I expect to review soon) would depend on technological savvy too, but in a much more creatively thought-out and designed manner. Leeb feels that the relentless upward push on the price of oil is unstoppable. He wrote the book when oil traded at about $70, which at the time was considered high. Since then, it has doubled again, but now has retreated. He also wrote the book just as the subprime mess was starting, and does not predict the mortgage and credit meltdown that has actually happened. At one point, however, he says that he hopes his book will inspire the creative thinking that could delay or prevent an eventual $200 price in the real world. Leeb, criticizing the “modern portfolio theory” (MPT), offers advice for investors in an environment of inflation, which includes holding gold and precious metals or stocks, and oil and renewable energy stocks. He offers warnings about depending on cash and particularly bonds as “conservative” strategy for retirees.